The application of water alone is ineffective for cleaning skin because water is unable to remove fats, oils and proteins, which are components of organic soil, There fore removal of microorganism for skin requires the addition of soap or detergents to water. 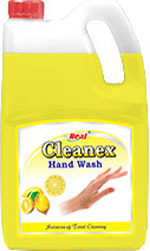 Cleanex Hand Wash is perfectly balanced to leave your skin exceptionally clean and freshly scented. Together with hand repair. It's the only answer to soft an silky hands. It helps reduce fatigue and improve motivation. Cleanex Hand Wash rich and creamy is the only way to describe the luxurious lather of Deep streps foaming hand wash. As instant foam gently cleaners your hand, organic extracts leave skin feeling soft and smooth with deep steeps extract foaming hand wash, you can finally enjoy washingyour hands. Remove hand and arm Jewelery. Add Cleanex Hand Wash and than rub your hands together making a soapy lather. Do this away from the running water for at 15 seconds, being carefulnot to wash the lather away. Wash the front and back of your hands. Rinse your hands well under warm running water. Put hands dry with a paper towel. Turn off water using same paper towel and dispose.